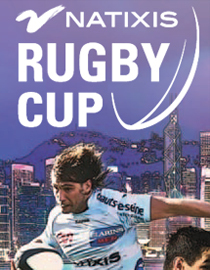 When Jean-Baptiste Aldigé, a Frenchman living and working in Hong Kong and playing rugby for the Valley Club there, and his associate began talking of the idea of playing an exhibition match between 2 French teams in Hong Kong, the first steps towards the Natixis Cup were taken. They contacted Philippe Spanghero, Managing Director of Team One Groupe , an established and exciting Sports Marketing company based in Toulouse, France. It was then that Team One Asia was formed and the venture began. It was now the event really began moving forward. Philippe managed to bring on board Racing Metro 92 (for 2 years) and Stade Toulousain (1 year). This was a massive move and showed the initiative and drive of Team One Groupe and also the forward thinking of both clubs. Philippe also signed Natixis Bank as title sponsors for the event for 2 years, another exciting move. There was much more work to be done, Philippe fought hard to gain permission from the French Rugby Federation, the French National League and also the IRB in order for the game to be granted official status, a must for this type of event. The logistics of bringing 2 teams plus staff and directors half way across the world are enormous and the staff of Team One Groupe in France and Team One Asia in Hong Kong worked tirelessly to prepare not only the match but a week of preparation for both teams. Flights, accommodation, transport, food, training pitches, gyms, medical facilities, these are but a few of the elements needed to take into consideration to succeed in the operation. 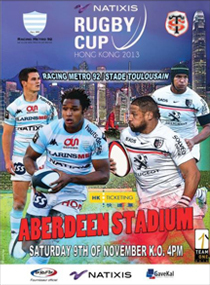 The match was scheduled for Saturday 9th November 2013 where there was a pause in the French Top 14 season because of the Autumn Rugby Internationals. Aberdeen Stadium was chosen for the venue of the match. The teams arrived on Monday 6th November ready for an action packed week. The idea for the Natixis Cup was never solely about a game, but about introducing the two teams and their players to the people and businesses of Hong Kong, and vice versa. Thus throughout the week several PR events were organized by Team One Asia for both teams. There were shared training sessions where Racing and Toulouse trained with two local teams, rugby camps for local school children as well as a grand Gala Dinner on the Thursday night held at the exclusive Hong Kong Football Club. This Gala Dinner was truly a great success with all 33 tables selling out very quickly. The guests were amazed at the interaction they were able to have with the players during the evening and the entertainment was second to none (especially the singing from Ronan O’Gara, Jamie Roberts and Wiliam Servat)! Whilst the players were going about their preparation Team One Asia accompanied directors from both Racing and Toulouse to a number of meetings throughout the week. These were with the Hong Kong Federation, local clubs and also major businesses interested in being associated with teams in France. The day of the match arrived and 6000 excited spectators arrived to see two giants of French Rugby go to battle. The match was very toughly fought with some massive hits coming in from both teams. Eventually Toulouse wound up victors by 19 points to 12 but all who came were extremely pleased with the ‘real match’ they had seen. The second installment of the Natixis Cup in February 2015 promises to be a hugely anticipated event. Watch this space!